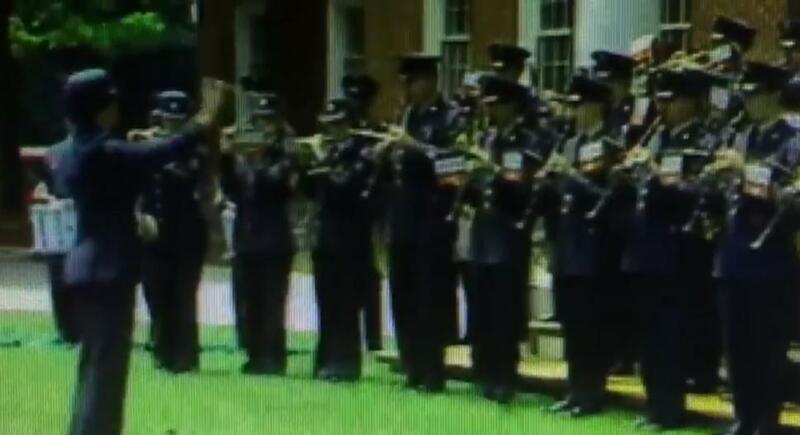 A still from CNN’s Doomsday video, starring all four services’ military bands. What’s the one thing you’d like to see at the end of the world? If you answered “a military band,” then CNN’s got you covered. A truly weird relic of CNN’s early days surfaced earlier this week when Jalopnik posted the network’s fabled “Doomsday video.” As founder Ted Turner told the New Yorker back in 1988, the 24-hour CNN would only sign off once, in case of nuclear annihilation or other such apocalypse. So he gathered the Army, Navy, Air Force and Marine Corps marching bands for a videotaping at CNN’s old headquarters and had them perform the National Anthem. Turner said he then asked them to play “Nearer My God to Thee,” which is believed to be the last song the musicians aboard the Titanic performed as the ship sank. Turner told the New Yorker that once he made his request, “those guys in the military bands knew what I was up to.” If that’s true, I wonder if they felt slightly morbid, to knowingly record humanity’s swan song. I’ll give Turner credit for one thing: At least he was thinking ahead.